Vundle is undergoing an interface change, please stay up to date to get latest changes. 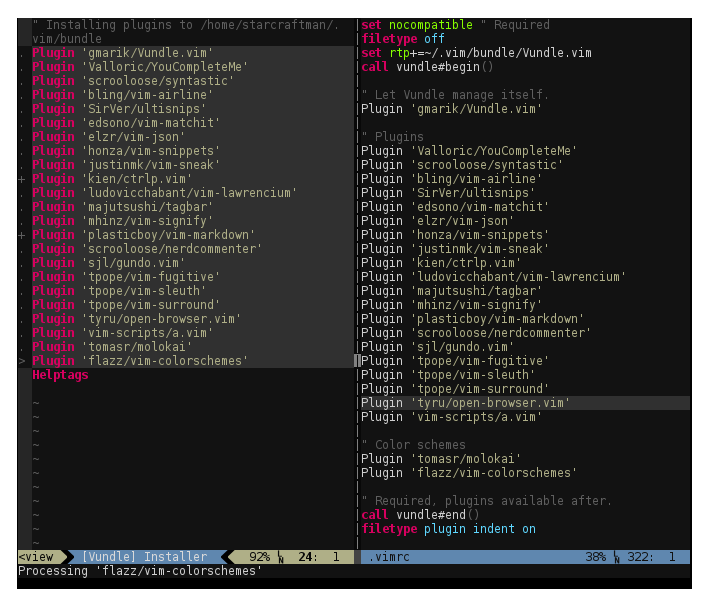 Installation requires Git and triggers git clone for each configured repository to ~/.vim/bundle/ by default. Curl is required for search. If you are using Windows, go directly to Windows setup. If you run into any issues, please consult the FAQ. See Tips for some advanced configurations. Using non-POSIX shells, such as the popular Fish shell, requires additional setup. Please check the FAQ. Put this at the top of your .vimrc to use Vundle. Remove plugins you don't need, they are for illustration purposes. See the :h vundle Vimdoc for more details. Vundle is a work in progress, so any ideas and patches are appreciated. [ ] allow specifying revision/version? [ ] make it rock! Would you tell us more about VundleVim/Vundle.vim?